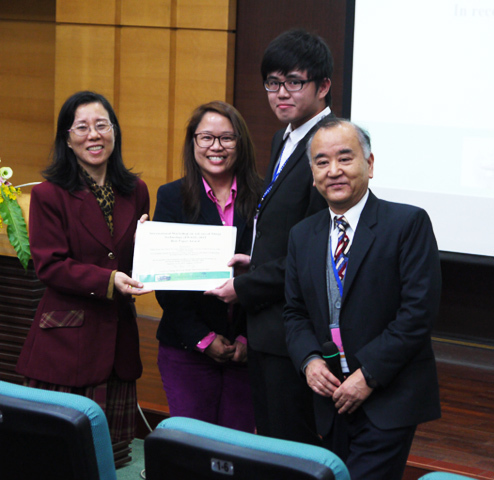 UTAR Master of Computer Science student Tan Ching Soon won the Best Paper Award in the International Workshop on Advance Image Technology (IWAIT) 2015 held at National Cheng Kung University (NCKU), Taiwan from 11 January to 13 January 2015. 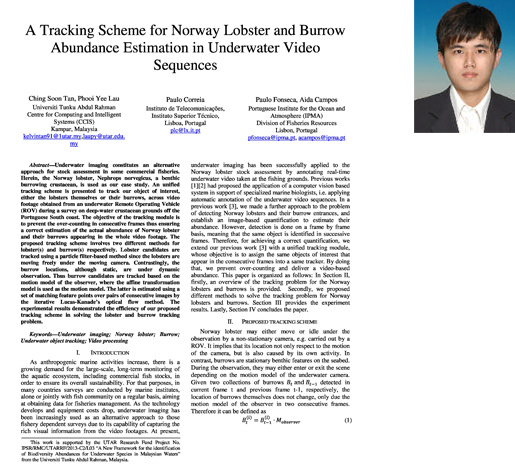 Tan submitted two papers to IWAIT, and one of the papers titled “A tracking scheme for Norway lobster and burrow abundance estimation in underwater video sequences” won one of the best paper awards. 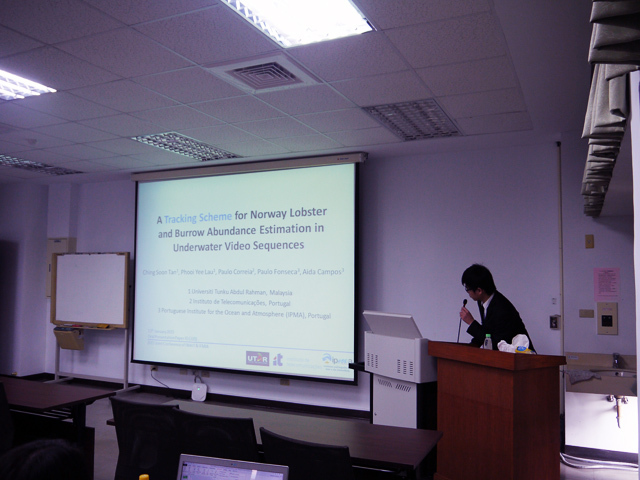 The award winning paper, which Tan co-authored with Dr. Lau Phooi Yee, Prof. Paulo Correia, Dr Aida Campos and Paulo Fonseca was a proposal on a unified visual tracking technique used to deliver a video-based abundance of the Norway lobster and its biological feature, burrow, by scanning the underwater video footage obtained from the underwater remote operated vehicle. The paper was initially selected from among 214 submitted papers and competed with the ten selected papers in the final round. The evaluations for the best paper award were based on two selection criteria where the first round of selection was based on camera ready paper quality and second round of selection was based on the presentation of the research topic with evaluation from the specially selected technical committee. “I spent almost 2 months to complete this paper, and I had several rehearsals to prepare myself for the oral presentation with the guidance from my supervisor, Dr. Lau Phooi Yee, and the members from the Portuguese Institute for the Ocean and Atmosphere (IPMA), Prof. Paulo Correia, Dr Aida and Paulo Fonseca. This achievement is the result of a joint team effort and university support through the Research Grant Research Fund Project,” said Tan. He expressed gratitude to his supervisor, Dr Lau for her supervision and support as well as thanked the Portuguese team for their valuable suggestions. The International Workshop on Advance Image Technology (IWAIT) 2015 is a maiden joint effort by IWAIT and International Forum on Medical Imaging in Asia (IFMIA). IWAIT is a well-known international workshop in the field of advanced image technology, while IFMIA focuses on the latest development in the field of medical imaging. IWAIT 2015 saw a gathering of researchers, professors, students and interested parties around the world to exchange new ideas and findings in their knowledge domain.